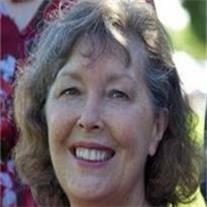 Gloria Lynn McArthur, 62, passed away on November 11, 2012 in Gilbert, Arizona after a brave battle with cancer. Lynn was a devoted woman who gave all of herself to the Lord, to her family and to everyone she loved and served throughout her life. She is survived by her loving husband, Skip, children Heather, Kristina (Ryan), Terry (Michelle), Benjamin (Deanna), Daniel (Becky), Cambron (Joey), Rebecca (Andrew), Lisa (Kevin) and 20 grandchildren. Funeral services will be held Friday, November 16, 2012 at 9:30 AM at the LDS Chapel at 1483 North Driftwood Drive in Gilbert. Visitation will be held on November 15, 2012 from 6PM to 8PM and November 16, 2012 from 8:30 AM to 9:15AM at the LDS Chapel at 1483 North Driftwood Drive in Gilbert. In lieu of flowers, donations can be made to the LDS Humanitarian Aid Fund at give.lds.org/humanitarian. Funeral arrangements handled by Bunker’s Garden Chapel, Mesa, Arizona.